WE STOCK EVERY SINGLE PART FOR MIDWEST PACIFIC HEAT SEALERS! 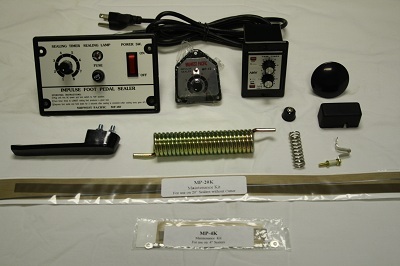 PackCo Inc. stocks every Midwest Pacific heat sealer part from maintenance kits, which contain 2 heating elements--upper Teflon and lower Teflon, and silicone rubber pressure bar pads, to timers (control panels) and transformers and every part in-between...right down to the smallest screws. If you need ANY part for any model of Midwest Pacific heat sealers, we stock it! Please call us at (573) 392-2400 with the complete model number of your Midwest Pacific impulse heat sealer or constant heat sealer and we will quote any parts you need. Parts usually ship within 24 hours.